Hi everyone, Katie Sunny here. Go back to your nap. Katie, Carl thinks you are hot every day! YAWN. Yeah. We're like supposed to be up to the mid eighties this weekend. The hottest we've had so far! Katie, we think you're hot, even in a snowstorm! She goes downtown, the mancats all stop and stare. When she goes downtown, she walks like she just don't care. It's hot in New York too but Katie is cool. Love the shades. Katie, hot or not, you are always cool! Are you trying out yet another career option? We think you make an excellent weathercat. Thanks for the update Katie, it is hot here too. I am gonna chill out inside with my Mommy. No matter how hot it gets you always look cool Katie. I think we need your forecasting skills here, Miss Katie. We knew that, Katie! We've been hot hot hot for too long!! Katie, you're such a natural in that role. Perhaps another job for you to consider? Doesn't surprise me, you're always hot Katie! Purrfect job, Katie! Can't wait till you bring the cooler weather! Katie! You should put on your bikini! This is what is known as the Cat Days of Summer. You're one cool cat no matter what the thermometer says. Gonna be 100 here and the peeps are going to a game tonight! Yikes! 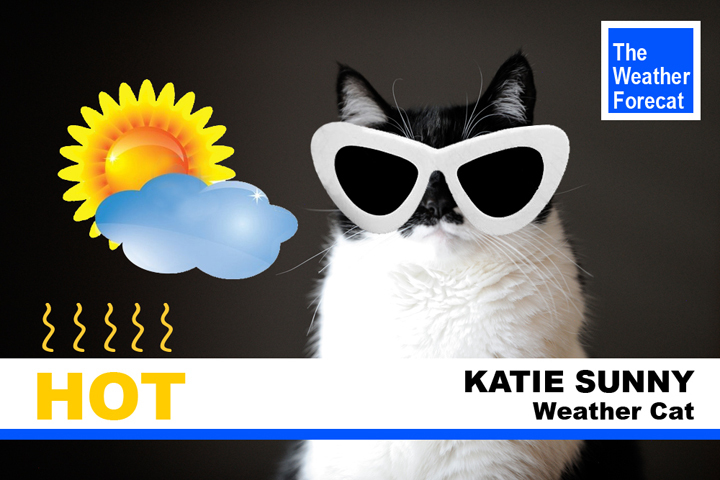 Thanks for the weather report -- despite the heat, you are one cool cat!! Oh please pass on some hots here as it's gone rainier and cooler here in the UK!!! Thanks for the forecast Katie. is this your new job? A very perceptive forecat, Katie! Yep, it is 8pm in Dallas, and it is still 98F degrees. Actually, since it got up to 107F today, that pretty cool! Yup! Its like that here too! But we are expecting it to cool off at night! Forecast today, sunny with a ZERO percent chance of me going outside. Drought conditions down here fur sure. I'm just sayin'. You too?